John Krokidas’ Kill Your Darlings, which covers the initial meetings between Allen Ginsberg (Daniel Radcliffe), Jack Kerouac (Jack Huston), and William S. Burroughs (Ben Foster), doesn’t quite cross that line, but the other side is clearly visible from where the film stands. The wisest decision Krokidas and co-writer Austin Bunn make is to focus on a time before the Beats were Beats, and to put at its center the relatively unknown relationship between Ginsberg and Lucien Carr (Dane DeHaan), a fellow Columbia student who, at least according to this account, was the first to suggest that the group brand themselves as an insurgent literary movement. It’s never fully clear what Carr’s “New Vision” stands for, apart from a general opposition to tradition, rules, and the bestselling doggerel of Ogden Nash, who appears as a distant figure in a jazz club. The closest the group gets to a statement of purpose is breaking into the Columbia library and replacing the prized display copies of the Gutenberg Bible et al. with off-limits works like Henry Miller’s Tropic Of Cancer, an escapade that but for the fact that it’s anachronistically set to TV On The Radio’s “Wolf Like Me” feels more like a juvenile prank than a statement of purpose. (The sequence lacks only the climactic shot of a puffed-up, scandalized William Atherton.) But then, the pranksters aren’t the Ginsberg of “Howl” and the Burroughs of Naked Lunch; in fact, these writers do little writing, if any. Kerouac is introduced as a man who’s already written “a million words,” but viewers don’t hear or see any of them. Kerouac and Burroughs are minor figures in Kill Your Darlings, and they make minor impressions: Foster mimics Burroughs’ nasal drone, but lacks his hungry intensity, and Huston’s Kerouac is a rugged, handsome shell. (Elizabeth Olsen, as Kerouac’s future wife, then ex-wife, Edie Parker, fares even worse: Her character might as well be called “Disapproving Girlfriend.”) But DeHaan and Radcliffe get under their characters’ skins and turn them into more than human bookmarks. As Ginsberg, Radcliffe isn’t unrecognizable, but he’s startlingly distinct from his previous roles. In a nifty bit of casting, Krokidas cast David Cross, who so memorably caricatured Ginsberg in I’m Not There, as Allen’s father, but there’s barely a hint of the bearded libertine Ginsberg became. Radcliffe’s Ginsberg knows he’s opposed to the predictable form of rhyming, rhythmically consistent poetry, but he doesn’t know what he’s for, nor has he apparently ever acted on the homosexual desire later explored so explicitly in his writing. He’s hungry but frightened, his large-framed glasses acting as a shield against the world. Carr, by contrast, is a dandy, self-consciously living the life of a writer, even though he can’t even complete his English assignments without help. He tosses off witticisms as if there’s a Boswell trailing in his wake, jotting them down for posterity: Ushering Allen into a bohemian party, he grabs a strange woman, plants a kiss on her lips, and walks away, quipping, “She tasted like imported sophistication and domestic cigarettes.” It’s like he’s cosplaying Oscar Wilde, except for the fact that as much as he enjoys projecting a certain ambiguous sexuality, he’s deeply afraid of homosexuality—or more specifically, homosexuals. It’s no spoiler to say that Carr killed David Kammerer (Michael C. Hall); it’s part of the historical record, and Kill Your Darlings’ first shot is of Carr holding Kammerer’s bloody, lifeless body. But the why of it will always be fuzzy. Carr’s explanation was self-defense mixed with gay panic: Kammerer, who’d followed Carr from city to city like a smitten stalker, came on too strong, and Carr stabbed him with a Boy Scout knife. But in Krokidas’ telling, Carr is at least somewhat complicit in leading Kammerer on, coaxing him to do the schoolwork Carr won’t or can’t do. He also isn’t exactly the Kinsey-scale zero he pretends, although he’s attracted to Ginsberg, not Kammerer. 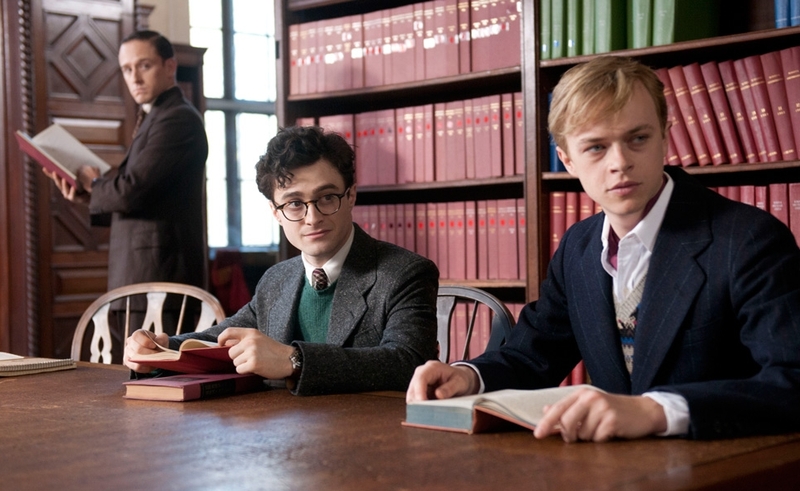 Unfortunately, Kill Your Darlings doesn’t know what to do with Radcliffe and DeHaan, good as they are; there’s little sense of how they fit into a larger framework, or what bearing, if any, it might have on its more famous subjects’ later output (which is presumably why the audience showed up). The closest Krokidas gets to a thesis is intercutting Kammerer’s stabbing with Ginsberg being anally penetrated for the first time—an audacious linkage, but one the film provides little help in parsing. Given that the future Beats have already forged a connection, Kammerer’s death feels oddly inconsequential, except to Carr; it’s as if he’s simply a pretext for the film to touch down at a certain time and place. If the implication is that the Beats crawled over a dead man on their way to success, something similar could be said about Kill Your Darlings itself.